NETWORK FINALS: There were no adjustments from Friday’s preliminary ratings. CABLE HIGHLIGHTS: ESPN had the night’s NBA PLAYOFFS games at 1.48/1.39. Cable coverage of the NFL DRAFT was split between ESPN and ESPN2 (0.75/0.54), and also carried on NFL Network (0.39). 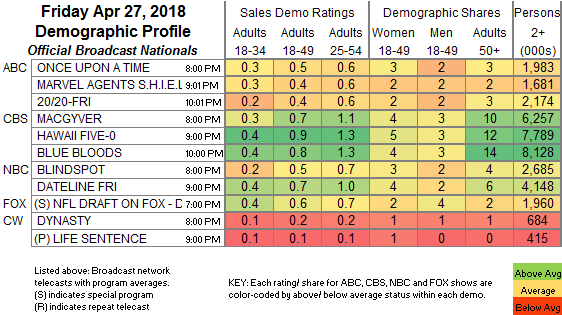 A&E’s LIVE PD dipped 0.03 to 0.61, after a clip hour at 0.32. On Discovery, GOLD RUSH gained 0.03 to 0.46, and BERING SEA GOLD was down 0.05 to 0.31. On HBO, REAL TIME WITH BILL MAHER fell 0.08 to 0.30, and WYATT CENAC’S PROBLEM AREAS was down 0.04 to 0.04. 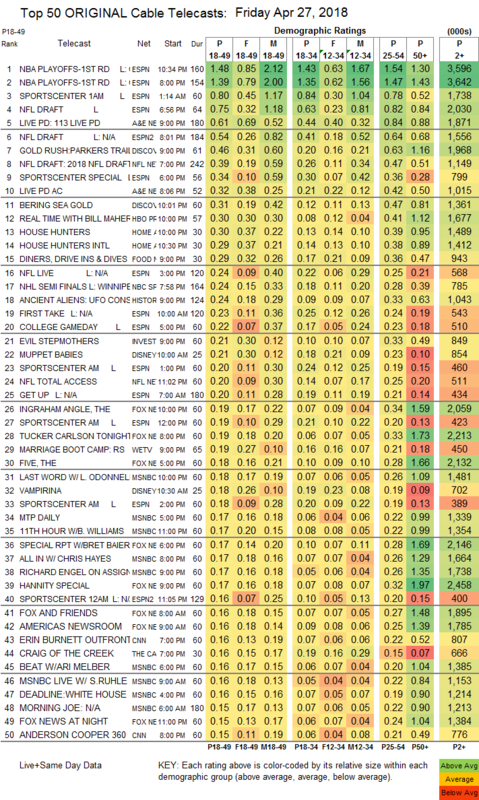 On HGTV, HOUSE HUNTERS rose 0.07 to 0.30, and HOUSE HUNTERS INTL was up 0.08 to 0.29. Food Network’s DINERS, DRIVE-INS & DIVES was at 0.29. NBC Sports Net’s NHL PLAYOFFS game was at 0.24. ID’s EVIL STEPMOTHERS climbed 0.05 to 0.21. We’s MARRIAGE BOOT CAMP ticked up to 0.19. Cinemax’s RELLIK fell even further off the chart, down 0.02 to 0.01/52K.